Sable, a bicorporate lion and on a chief Or, three laurel wreaths sable. Meaning: Lion is the symbol for Nassau County. End comes from the fact that our neighbors to the east are the Barony of An Dubhaigeainn, which translates to abyss. Before you reach the abyss, you have to come to the end. (This has been paraphrased from the heraldic name submission found here). 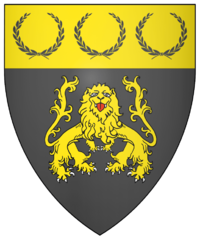 Blazon: Sable, a bicorporate lion and on a chief Or, three laurel wreaths sable. This page was last edited on 18 March 2019, at 10:42.